The political dimension to the latest attempt at candidate disqualification in the Iraqi parliamentary election has now been spelt out: In an interview, IHEC commissioner Amal al-Birqadar has made it clear that there is a specific request from State of Law (SLA) for the votes of the three candidates, two from Iraqiyya (Najm al-Harbi in addition to Abdallah Hasan Rashid) and one from INA, to be annulled, on the basis of two legal convictions and membership in the Iraqi armed forces respectively. If those votes are cancelled, preliminary calculations show that SLA could suddenly emerge as the biggest bloc in parliament. As for the IHEC response, it has emerged that it has proceeded to replace Harbi and Rashid by others from Iraqiyya, whereas the INA candidate, Furat al-Sharaa from Basra, has apparently been successful in presenting evidence that he is no longer a member of the armed forces (the strict legal criterion on this should however relate not to today’s situation but to the date of nomination, which was last autumn). Birqadar goes far in suggesting that IHEC considers there will be no annulment of votes (and hence no seat-allocation changes), but she also says IHEC will make a decision within days. Birqadar does not refer to a specific law or regulation but says IHEC’s position has been made clear on this in public: If any candidate becomes non-eligible, the next person on the list will follow. This could be something that is buried in an IHEC regulation, but it might also simply refer to article 14 of the 2005 election law which still stands, and which says that “if a member [i.e. deputy] loses his seat for whatever reason, he shall be followed by the next person on the list”. Since this procedure has already been confirmed by IHEC as applicable to the current situation in Nineveh – where a recently-elected MP for Iraqiyya, Bashar al-Agaydi has been murdered – it should mean that it applies generally to the transitional period between the announcement of the uncertified result and the swearing in of the new parliament. As such it should also make all kinds of politically-motivated post-election exclusion attempts redundant (whether on de-Baathification or other grounds) since the seat allocation will remain unaffected regardless. From the point of view of democratic theory this is a promising stance by IHEC, but it has to be noted that Birqadar is considered the IHEC commissioner that is closest to Iraqiyya, and it will be interesting to see what the others conclude. Faraj al-Haydari, the chief of the commission linked to the KDP, is however also on record saying that annulled candidates should get their votes transferred to their lists. In general INA is thought to be more influential within IHEC than SLA, but lately SLA has increasingly managed to get what it wants from the Iraqi judiciary. Today there are reports that the courts have asked IHEC for certain clarifications pertaining to the certification of the result. There are conflicting stories out of Iraq about some last-minute challenges to the parliamentary election result that could mean further delays in the process of certifying them. The first is a Reuters report claiming that “four former seat-winners” in Baghdad who had lost their personal seats in the recount have mounted appeals. This seems untrustworthy for two reasons: Firstly, there are only three and not four changes in the Baghdad recount. Second, one of them pertains to Ibrahim al-Mutlak, who presumably has already appealed the decision to exclude him on the basis of de-Baathification earlier – his appearance as a case of “change” in the Baghdad recount is entirely spurious and has nothing to do with votes that had been miscounted. Only Maysun al-Damluji and Jabir Habib Jabir lost their personal seats as the result of the recount. The second is an even more fantastic-sounding story (but reported in different iterations by a number of sources) that the ministries of interior and defence have sent letters asking for the disqualification of two seat-winning candidates, Abdallah Hasan Rashid of Iraqiyya in Diyala, and Furat al-Sharaa of ISCI/INA in Basra. The former is supposedly convicted in a serious-crime case and the second is an officer in the Iraqi army and as such should not be permitted to stand for election (though he has already served in the Basra provincial council). The awkward legal justification for this kind of appeal (so long after all reasonable deadlines have expired) plus the seniority of the people involved (they are number one and two on the result lists for their entities and have close to 40,000 personal votes each which is more than the average electoral divider) make it difficult to discount the idea of political motives. A quick recalculation of the results based on the annulment of votes for excluded candidates (it remains unclear what IHEC has decided to do on this, for example in the case of Ibrahim al-Mutlak) suggests that State of Law could win one seat in Diyala and Iraqiyya could lose one if the large vote for Rashid is cancelled (on top of that of Raad al-Bayati). In Basra, State of Law would apparently also win one seat and Iraqiyya (rather than INA) would lose one, all due to the change in the electoral divider (very quick back-of-an-envelope calculation, disregarding minor changes due to post-election de-Baathification of non-winning candidates). And voila, State of Law would apparently have more seats nationally than Iraqiyya! The attack on both Iraqiyya and ISCI makes it somewhat hard to avoid a conspiracy theory involving sympathisers with State of Law within the defence and interior ministries – perhaps another rapprochement between State of Law and Unity of Iraq/Bolani? Hopefully the Iraqi judicial authorities will not opt to wait for the All Clear from the politicians to certify the election results, since the weekend has been a pretty ordinary one with the usual wide-ranging array of predictions as to when the new Shiite alliance will become a kutla in its own right with a leader and a name – and a premier candidate. Estimates varied from “very soon” to “within 10 days”; in other words an echo of the situation in July 2009 and indicating that agreement is not even close. Unless Ayad Allawi of Iraqiyya and Nuri al-Maliki can agree to cut through the crap and meet in private, the intra-Shiite process can take many, many weeks, and that is before they even begin talking to the Kurds. So in the meanwhile, here are a couple of reflections on the last grand stand of Ali al-Lami, the de-Baathification director who now seems to have been abandoned even by Ahmed Chalabi and his other list allies in INA as they instead focus on reaping the fruits of his efforts to repolarise Iraqi politics along sectarian lines. Recent evidence cited by Al-Hayat but not really analysed in detail by the paper reveals many fascinating clues about the flawed jurisprudence that has guided the de-Baathification committee in its work to exclude selected political opponents and generally whip up an atmosphere of sectarianism and distrust prior to the 7 March elections. Perhaps the most fascinating feature of the interview is that Lami repeats his intention to appeal the decision whereby 9 recently de-Baathified candidates were reinstated by the special appeals board for de-Baathification cases. This is remarkable not only for the fact that the two relevant pieces of legislation, i.e. the accountability and justice law of January 2008 as well as the IHEC regulations for certification of entities and candidates, both say the decisions on appeals in these matters cannot be appealed to any other authority. It is also what Lami said himself when he was successful with his previous batch of 52 post-election exclusions and there was talk about intervention by the presidency council: These decisions cannot be appealed, viz. Other interesting nuggets of information in the article include the justifications offered by the de-Baathification authorities in their attempts to exclude individuals. For the first time, the name of the State of Law candidate that was attacked by Lami in the last batch of exclusions is actually mentioned – Jabbar Abid al-Qurayshi who ended up as the second best SLA vote-getter in Wasit (and whose exclusion, if implemented along with that of Jamal al-Batikh of Iraqiyya, would have given the last seat in the governorate to INA instead of SLA). What’s more, the piece of evidence offered in support of his exclusion is simply that he received a medal from the Baath party in 1999 and held a job at the mudir or director level in 2000 – neither of which suffices for exclusion under the accountability and justice act. Turning to the Iraqiyya candidates, the evidence used by the de-Baathification committee and obtained by Al-Hayat also contains documents showing that a female member of Iraqiyya in Anbar had been a member of the Baath at the ‘amil (active) level. But again, that is quite irrelevant with respect to the de-Baathification legislation, which does not pertain to this kind of junior membership. The same problem applies to the attempted exclusion of Labna Rahim, who had a membership at the firqa level. Again, the accountability and justice act expressly allows for the return to service of bureaucrats who held this rank of membership except for the presidency and certain sensitive branches of government. Aliya Nusayf was even sought excluded because she had been a trainee member of the Baath! Finally, the evidence obtained by Al-Hayat reveals an attempt by the de-Baathification board to incriminate Iskandar Witwit in aiding counter-insurgency operations in 1991 (even though he at one point was accused by the Baathists for having sided with the rebels). Whatever the truth of the matter, the key point is that the Iraqi constitution of 2005 implicitly states that participation in counter-insurgency operations in 1991 does not in itself disqualify anyone from serving as a member of the Iraqi parliament. This is so because the requirements for membership of the presidency council make it clear that the president and his deputies must fulfil the requirements of a parliamentary deputy, “and, additionally, must not have participated in repressing the 1991 uprising”. The language of the constitution would in fact have been meaningless if a deputy could also be excluded solely on the basis of counter-insurgency activity in 1991. Lami’s flawed arguments will likely meet with the ridicule they so abundantly deserve. More worrisome is the fact that he will also be construed as a loner, while the international community will rush to support the people that benefited from his actions and their attempts to form a “government of national unity” of ethno-sectarian leaders. The lasting legacy of Ali al-Lami is in fact a monumental one: Through de-Baathification, he created pressure on SLA and terrorised Iraqiyya supporters south of Baghdad and made a normal, issue-based coalition-forming process in Iraq next to impossible. An interesting development in the Iraqi government-formation saga is that Iraqiyya has successfully managed to highlight certain weaknesses in the newly formed Shiite alliance, especially regarding its formal status as a “parliamentary bloc” (kutla niyabiyya). This began last week when Radwan al-Kilidar questioned the status of the newly formed entity because of its lack of a name and a parliamentary leader. Interestingly, various members of the newly formed entity responded by saying they would select one: Both Karim al-Yaqubi (Fadila) and Falih al-Fayyad (Jaafari branch) recently made such pledges, implicitly accepting Kilidar’s charge. Today, Ali al-Dabbagh, who is close to Nuri al-Maliki, went further in an interview with Al-Sumaria. He explicitly said that Iraqiyya is the biggest bloc at the moment because the new Shiite bloc has yet to find a leader and a name. So, Iraqiyya is indeed largest, for now. As of today, it has the right to form the government, even according to its opponents. But what can it do? So far, its negotiation attempts have not taken it far, since the Kurds seem to think they can get a better deal from a Shiite alliance, and since endless sweet talking with ISCI or the Sadrists does not seem to produce what Iraqiyya wants in terms of an Allawi premiership. What Iraqiyya could do, however, is to make a last-minute serious offer to State of Law. As has been pointed out so many times before, these two alliances could form a government together and thereby save themselves the trouble of sharing posts (including the president and the parliamentary speaker), power and ideological platform with all the others. For strange reasons, the Iraqi press still talks about a two-thirds requirement for selecting the president: There is no longer such a requirement in the constitution since the subsequent paragraph of the relevant article provides for a run-off with no special majorities. Power-sharing was an exceptional, transitional regime for 2005–2010; there is now no constitutional requirement for power-sharing in a system where considerable autonomy has already been granted on a territorial basis, most notably to the KRG. The real winners in the election need neither the futile “roundtable” which Ammar al-Hakim has demanded repeatedly (and which Talabani apparently will go ahead with tomorrow) nor the oversized government of national unity called for by nervous voices in the international community that care more for their own short-sighted agendas and timetables than for Iraq’s long-term development. Over the past few days there have been interesting signs that certain Iraqiyya members are thinking in this direction. Taha al-Luhaybi (Hiwar) has highlighted political points of convergence with State of Law. Both Arshad Zibari and Fattah al-Shaykh have emphasised the importance of not giving any concessions to the Kurds concerning implementation of article 140. If they pursue this argument a little longer, maybe Iraqiyya could see that a parliamentary majority of 180 is just the right size for giving Iraq the strong and effective government it needs? A generous and specific offer from Iraqiyya to State of Law could realistically clinch such a deal before the newly-created Shiite alliance has finished pondering what to call itself and who should lead it. “Win–win” is the term that comes to mind. In an interview with Sumaria News today, the director for de-Baathification, Ali al-Lami, has admitted that the 9 winning candidates that he sought to exclude have been successful in their appeals to the special de-Baathification board. In many ways, this is old news, since influential political voices including the presidency council and Ahmad Chalabi have already said they wanted it to be this way. They have after all achieved what they were interested in (and therefore no longer need Lami): Discouraging Maliki from the idea of building a political majority and forcing him back to the logic of an oversized, governing-council style government of “national unity”. It should be stressed that there appear to be at least two real seat-winning victims of the de-Baathification campaign: Ibrahim al-Mutlak of Iraqiyya (who was in the initial list of 52 de-Baathified and did not appear on the revised list of Baghdad winners; some newswires erroneously attribute this demotion to the recount), and, possibly, Raad al-Bayati, also of Iraqiyya, in Diyala, and among the original 52 exclusions. It is interesting, too, that Lami expressed his intention to “appeal” the decision! Regardless of which of the several legal frameworks involved (i.e. the accountability and justice law, or the IHEC regulations on approval and registration of political entities), these decisions cannot be appealed, period. Wasn’t Lami himself quick to point that out some months ago when the legal authorities were working in his favour? The Iraqi elections commission, IHEC, today announced the results of the Baghdad recount. The discrepancy between the original result and the manual recount was only around 3,000 of more than 2,000,000 votes and, in line with predictions, the seat allocation between parties remained unaffected. 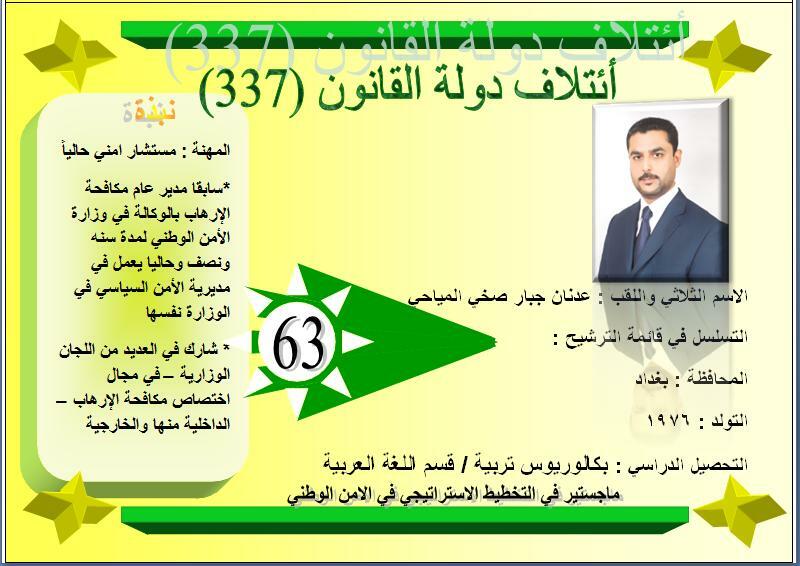 A new Baghdad MP: Adnan Jabbar al-Mayahi of Daawa (Tanzim al-Iraq), who has a degree in “strategic planning in national security” (though he was an undergrad in the Arabic language), and work experience in combating terrorism! The manual recount did lead to some minor changes in the list of Baghdad representatives, since this depends exclusively on the number of personal votes and as such is more susceptible to minor changes. Confirmed as casualties of this development is firstly Maysun al-Damluji of, of Wifaq, and the female spokesperson of Iraqiyya. She had just 650 personal votes and lost out to Fayza Kazim Muhammad al-Ubaydi (641 votes in the original count). The same fate applies to Jabir Habib Jabir, an independent with State of Law who was previously close to the Sadrists; he had 1,855 votes and is reportedly replaced by Adnan Jabbar al-Mayahi (originally at 1,822), of the Tanzim al-Iraq branch of the Daawa. A report on some Iraqi newswires to the effect that Ibrahim al-Mutlak, the replacement candidate for Salih al-Mutlak in Baghdad, had also lost his seat as a result of the recount (to Abd al-Karim Ali Abtan, at 2,807, of a nationalist group within Iraqiyya also represented in Kirkuk) is hard to believe given that he had 5,473 personal votes and would have had to lose more than 2,000 to fall below the lowest winning male Iraqiyya candidate, Ala al-Makki, at around 3,000 (unless, of course, he was in fact excluded as part of the de-Baathification process, where he was on the list of 52 and may have suffered personal exclusion even if Iraqiyya keeps his votes – this interpretation is confirmed in the official IHEC revised result for Baghdad released on 17 May). IHEC has repeated its call for candidates for the 7 compensation seats to be forwarded within 3 days, at which point everything will hopefully be sent to the courts for certification. Amidst a sea of rumours, probably the most reliable indicator that the de-Baathification purge of Iraq’s new parliamentarians is coming to an end consists of a report to the effect that the electoral commission, IHEC, has sent the results for 17 governorates (all except Baghdad, where a recount is going on) to the federal supreme court for approval and certification. This act would have been completely pointless had there been any probability whatsoever that political entities might lose votes as a result of ongoing or future de-Baathification proceedings. If that were to happen, the electoral divider would have to be re-computed for the affected governorates and seats distributed anew – and only IHEC has the authority to do this. The exact status of the appeals of the 7 to 9 winning candidates that have been reported as subject to de-Baathification remains somewhat unclear, but today’s report is the clearest indication yet that IHEC has no intention of stripping political entities of votes whatever the eventual de-Baathification status of individual winners on those lists. Meanwhile, the name of the eighth and hitherto unknown winning Iraqiyya candidate that was subjected to de-Baathification has emerged from IHEC documents: She is Lubna Rahim Karim of Wifaq and the decision to exclude her was approved by IHEC as late as 28 April. However, rough calculations indicate that even with the loss of her 8,400 seats on top of those of Iskandar Witwit that seemed at risk at first, Iraqiyya would in fact have kept its 3 seats in Babel. This all goes to show that the main impact of the de-Baathification purge was a sectarian repolarisation of Iraqi politics, rather than a change of the results as such. It is the general atmosphere of Iraqi politics that has suffered, and the coalition-forming process in particular. No doubt, international players will label the latest developments as positive ones, and, to a certain extent, they are correct. But they will overlook the fact that the reason de-Baathification comes to an end is that the authors of its revival in some respects seem to be on the verge of victory. Characteristically, it is not the judicial system but the accountability and justice committee headed by Ahmed Chalabi and Ali al-Lami that is once more driving the process, now apparently reversing its own decisions as if two wrongs could make a right (also with a little help from the presidency council). They have achieved the recreation of the all-Shiite United Iraqi Alliance, and have managed to consolidate the wedge between Maliki and Allawi, the potential alliance that Iran (and, incidentally, the Kurds) feared the most. And now they, alongside their partners in ISCI – whose domestic media was always jubilant about de-Baathification despite sometimes conciliatory gestures in Western newspapers – will perhaps be seen as “moderates” too, gallantly reversing their earlier threats for the greater cause of government formation! Another result of their actions, of course, is that the two most popular politicians in Iraq, Nuri al-Maliki and Ayad Allawi, are likely to see their positions severely weakened. The recent merger of the Iraqi National Alliance (INA) and State of Law (SLA) into a single parliamentary bloc has been met with considerable scepticism both inside and outside Iraq. Some of this criticism is well-founded and some of it rests on more shaky foundations. Certain critics of the new alliance – and in particular the Iraqiyya coalition which came out first in the recent elections with the highest number of seats for a single list – focus on the legal and constitutional dimension, claiming that the right to form the government assigned to the “biggest parliamentary bloc” in the constitution necessarily relates to a bloc that had an existence by the time of the relevant parliamentary elections (in this case on 7 March 2010). The constitution is not specific on this, but it could be argued quite plausibly that parliamentary elections are more meaningful in terms of democracy if voters at least have an idea about what sort of coalition-forming alternatives exist for the post-election period. This interpretation has been challenged by Iraq’s federal supreme court which in a recent opinion put post-election and pre-election coalition forming on the same footing, but this in turn has been criticised by Iraqiyya for constituting a move beyond the true remit of the court. Also it could be argued that even though INA and SLA have announced their merger as a parliamentary entity, they have failed to produce a name and a bloc leader – both of which became normal characteristics of coalitions that qualified as “parliamentary blocs” in the previous assembly. However, the problem with the legal approach to the issue does not rest so much in the theoretical domain. 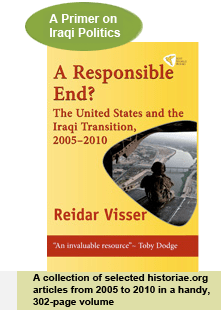 Rather, it has to do with Iraqiyya’s own approach to the eventuality of post-election coalition-forming in the autumn of 2009 and the first part of 2010. And in particular, it relates to Iraqiyya’s various (and ideologically contradictive) manoeuvres vis-à-vis INA in that period, which continued almost until the election date. The bottom line is that it is exceedingly difficult to understand these moves unless one accepts that there was an underlying intention of doing precisely what Iraqiyya is protesting today: To form a post-election bloc with the aim of trumping or blocking the list that came out with the highest numbers of votes. All too often, we tend to forget that the idea that Iraqiyya would emerge with a plurality in the elections was not entertained with any degree of seriousness even among the party faithful until after the elections, and that most of the pre-election coalition posturing was aimed at weakening Maliki and his SLA. The examples of this approach by Iraqiyya are numerous. For example, just after the final line-up of Iraqiyya had emerged in late October (i.e. in the shape it was submitted to IHEC), Hussam al-Azzawi told media that Iraqiyya “intends to form a broad front with the other coalitions, and those who are closest to us in this respect are the Iraqi National Alliance and the Kurdistani Alliance”. Even more remarkable is the fact that something similar was repeated well into February 2010. At that point, Adnan al-Danbusi of Iraqiyya told Al-Hayat that his coalition was in touch with several forces including INA and the Kurds in order to “form a wide national front”. What plausible motive could there be behind that front in February 2010, just weeks before the elections, other than a post-election plan to challenge Maliki who at the time looked likely to emerge with the biggest bloc? But if the legal argument may look like a contradiction when the pre-electoral behaviour of Iraqiyya is taken into consideration, there is another, and more compelling, criticism of the new Shiite alliance: It takes Iraq back to the primitive political atmosphere of 2005. Thankfully, at a time when most Iraqi politicians are careful to wrap their statements in a mist of nationalist rhetoric about “unity” and “coexistence”, some still speak a kind of language that is easier to understand. Back in December 2009, Jalal al-Din al-Saghir of ISCI, a long-time advocate of a merger between INA and SLA, called for “the brothers in State of Law and the Iraqi National Alliance to put the interests of the people and the public above their own interests, and to merge… The unity of these two coalitions [is] the coalition of the majority.” It is in this kind of frank references to majorities and minorities in ethno-sectarian terms that the true character of the merger project is revealed: It has been conceived to perpetuate Shiite dominance of Iraq in ethno-sectarian terms, pretty much like the old United Iraqi Alliance that was formed in 2004. What, then, are the viable options for Iraqiyya today? How can they protest against the sectarian repolarisation of Iraqi politics without proceeding down the blind alley of a legal argument that they are unlikely to win? It seems pretty obvious what some in the new Shiite alliance want them to do. For example, Bahaa al-Aaraji, a Sadrist, says Iraqiyya should be invited into a coalition government, not as a list but as one of the “components” (mukawwinat) of the Iraqi people. In plain Arabic, he means Iraqiyya should represent the Sunnis in an ethno-sectarian power-sharing arrangement. Some may think that sounds sweet and tolerant, but they should remember that last autumn the same Aaraji was very happy to ram through changes to the electoral law with support from the Kurds and in disregard of what many Sunni representatives wanted. In other words, if Sunnis and secularists accept the ethno-sectarian power-sharing logic and opt to enshrine it in Iraqi politics, they also ensure that they will forever remain in a minority position in Iraq. The alternative for Iraqiyya is to abandon the ethno-sectarian logic altogether and find back to its secular nature. Secular parties seek partners on the basis of ideology and not ethnicity. Instead of opting for an oversized government, they could make a last-ditch attempt to appeal to those in the Shiite alliances that are more interested in a shared vision of a strong, centralised Iraqi state. They talk about problems of Maliki getting “too strong”, but which is really the greater threat against Iraq’s survival right now: A strong premier (whose power can be balanced in a more effective government) or those who talk about an Iraq divided into regions based on sect and ethnicity? The oversized power-sharing government may create some temporary satisfaction among external players in Iraq, including Iran, Saudi Arabia and the United States. But it is also the solution that gives something to all Iraqi politicians and nothing to Iraqi citizens. All they will get is a big government that can accomplish absolutely nothing. Is This the PM Committee of the New Shiite Bloc? Not sure about the authenticity of this news item that has circulated in Iraqi media outlets for the past day, but it has now also been reproduced by the Iranian news agency IRIB (which is supposed to be in the know about what is going on at the top level in Tehran and among its friends in Iraq). Basically, the report says that a 10-person committee has been tasked with selecting the premier candidate for the new all-Shiite alliance that was formed earlier. It will do so with a consensus among 8 of the 10 leaders, and supposedly they will choose between Nuri al-Maliki, Bayan Jabar Solagh, Adel Abd al-Mahdi and Ibrahim al-Jaafari. It is noteworthy that the Sadrists, who make up 25% of the new Shiite alliance, are grossly underrepresented, whereas Chalabi and Jaafari are over-represented. Daawa has a good share, but almost everyone listed here are those who called for Daawa to join INA much earlier and were angry when Maliki refused to do so in August 2009. It should also be added that so far the above item has not been carried by the main ISCI news media (Buratha, Forat etc. ), which in other respects have lost no time in expressing jubilation over the new alliance. The list of PM candidates on offer also seems a little dated, and it would be slightly strange if ISCI should still try to promote both Solagh and Abd al-Mahdi after they were both given low ratings in the Sadrist “referendum”. More generally, Iraq seems to be teeming with rumours today that in various way challenge the credibility of the new Shiite alliance, including rumours of Unity of Iraq still seeking alliances with State of Law and Iraqiyya and pro-INA commentators demanding answers from Maliki about rumoured negotiations with Iraqiyya in Amman!